We spotted a nice boutique. A very nice boutique. I hesitantly walked inside, and my eyes were instantly transfixed on a pair of shoes. It was the first time I came to understanding how women feel about shoes. These were Roberto Botticelli’s. Absolute beauties! They lit the torch of my burning impulsive desire to rise in the social hierarchy of attention. 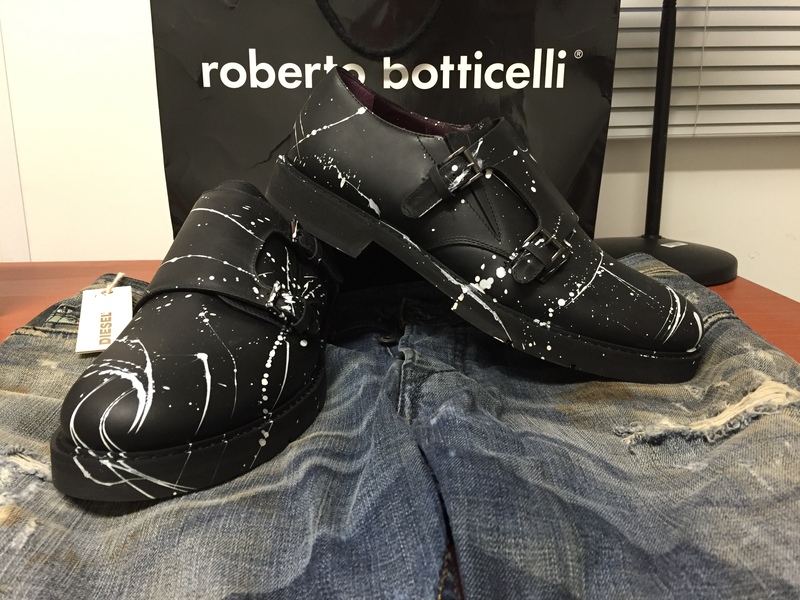 In their decadence, artistic white spots dazzled atop of hand-made pure black leather shoes – a magnet for attention. The shoes were begging to be touched. Every drop of white paint seduced my feet, making my toes curl up and salivate for the warmth of the provocative shoes. It is ironic how in this very moment, I finally understood the beauty of hand-crafted items that women go gaga over – especially a simple pair of shoes. I was able to finally appreciate the amount of care that was put into stitching these shoes together. All my life, I was adamantly against the idea of buying expensive shoes for the very simple reason that they were just shoes. But these Roberto Botticelli’s, albeit astronomical in price, instantly transformed my way of thinking. They dared me to jettison my old perception against lavish consumerism. On a similar sunny day, we were walking back from either the Coliseum or San Pietro in Vincoli church. I saw a Diesel store. I love jeans and I know Diesel is an Italian brand. I walked inside looking and wondering about the latest trends. I was thinking about my new spotted shoes when my eyes spotted a pair of jeans. They were blue jeans, boasting a front-faded wash with laced patches, and they appeared aged and rusted to perfection, giving them a vintage, antique effect. “They are limited edition!” the salesman proclaimed. “What does limited mean?” I asked. “Diesel produced only 978 of these jeans in the world! They are only for sale at high-end stores. And this is one of them. It is the establishment year of Diesel.” He answered. Already on a trend of buying expensive, name-brand items, I didn’t even hesitate to whip out my credit card for these rugged jeans. I guess with the purchase, I now belonged to this limited edition community called Diesel D:CODE. I became one of the 978 luckiest people among the 7.3 Billion on this planet. Excited, I walked out of the store looking at the jeans one more time. They were stamped with emotive words, “For Successful Living”. I am not sure what that truly means. Maybe I should wear it on interviews or dates and they will bring me more success! But I do know that I’ve been on this extravagant shopping binge lately, and being able to purchase these luxurious items has made me feel accomplished. “Yea, you should get a nice one,” she agreed. I thought to myself, I will buy it as a gift if the Angel of Good Fortune blesses me to accomplish my 40 by 40 goal. I would like to visit 40 countries by the age of 40. I need to visit 16 more countries. That’s quite a challenge, I know, but since I have the disposable income to do so, why not just go for it! Maybe I can join one of those ‘Around the World’ tours and knock out several countries in a matter of weeks. And then, I will buy a Rolex at the 40th country at the end of my trip. Aaahhh, the good life. Success makes us feel good. It feels good to feel successful and financially independent. BUT, as I was thinking about all of these material goods, my heart began to fill up with a mixture feeling of guilt and wonderment. Why do the pursuits of material things define our success? If I were stripped of all material things, would I now be unsuccessful? Many have become financially successful in America, but their pompous and vainglory character has killed them financially, socially, mentally, and sometimes even physically. It is quite ironic, yet devastatingly true. People are famous yet depressed, rich yet divorced, respected yet deceitful, powerful yet corrupt. Egos are like hot air balloons, requiring the helium of external attention to remain inflated, but once that helium runs out, they sink slowly through the air, allowing everyone to see their downfall, until they finally crash into the ground, dying a lonely death. I won’t let that happen to me. No matter what shoes or jeans or watches I wear, I will stay true to my character…to stay real and be real. I know I have virtues and vices in my flesh and blood. Financial and social success is easy; good character and virtue is hard. It is one’s character, not bank account, that defines his success. Success can take us many places and elevate us in social hierarchy, but it is the character that keeps us up there. In this society, our success might be validated by others through our financial, but I want people to remember me for my benevolence, honesty, and humble attitude. P.S. Did you read Happiness from Lalastan?